There are many ways that people can injure their knees. There are also many types of knee injuries. There are bones, tendons, ligaments, cartilage, and muscles in the knee. These can all be injured. Abrasion: this is the medical term for scraped skin. This happens when an injury scrapes off the top layer of the skin. A person may say that he or she "skinned" their knee. Pain is usually mild. This can usually be treated at home. Making certain the wound is clean is the most important thing. Cut - Superficial: superficial cuts (scratches) only go part of the way through the skin and rarely become infected. A scratch is an injury to the skin made by a sharp edge. For example, scratches can be caused by fingernails, a sharp nail, a piece of metal, or a branch of a tree or bush. This can usually be treated at home. Making certain the wound is clean is the most important thing. Dislocation: this is when a bone comes out of the joint. The joint always looks crooked or deformed. The pain is severe. A person with a knee dislocation will not be able to walk. This is serious and admission to the hospital is always needed. A doctor will treat this by putting the bone back into the joint socket. Dislocation of Kneecap (Patella): this is when the kneecap slips off the top of the knee joint. The knee joint will look funny or deformed. A person with a patella dislocation will not be able to walk. The pain is moderate to severe. A doctor will treat this by pushing the patella bone back into the right place. Fracture: this is the medical term for a broken bone. It means the same thing as a break or crack in the bone. The pain is severe. A person with a knee fracture usually cannot walk. Surgery may be needed. Patellar Tendon Rupture: this is a tear of the tendon just below the knee cap. Often a person cannot lift that foot and completely straighten the knee. Surgery is often needed. Quadriceps Tendon Rupture: this is a tear of the thigh muscle just above the knee cap. Often a person cannot lift that foot and completely straighten the knee. Surgery is often needed. Sprain: a sprain is the medical term used when ligaments are torn or over-stretched. Ligaments are the bands of tissue that connect bones to each other. This is the same thing as a "twisted knee". Knee sprains are very common. They happen most often while playing sports. Pain and swelling can range from mild to severe. Most knee sprains heal themselves with time and rest. Crutches and a knee brace are usually needed. For widespread stiffness, take a hot bath or hot shower instead. Move the sore knee under the warm water. Rest the injured knee as much as possible for 48 hours. FIRST AID: Wrap with a snug elastic bandage. Put an ice pack on the knee to reduce bleeding, swelling, and pain. Wrap the ice pack in a moist towel. 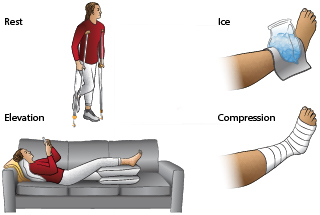 Treat with rest, ice, compression, and elevation (R.I.C.E.). Do this for the first 24 to 48 hours. 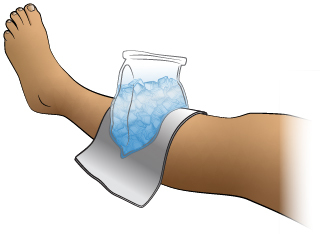 Keep using ICE packs for 10-20 minutes every hour for the first 4 hours. Then use ice for 10-20 minutes 4 times a day for the first 2 days. 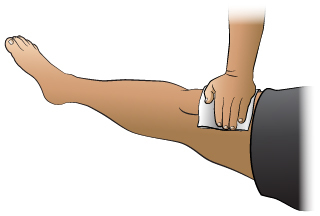 Apply COMPRESSION by wrapping the injured part with a snug, elastic bandage for 48 hours. If you feel numbness, tingling, or more pain, the bandage may be too tight. Loosen the bandage wrap. What to Expect: Pain and swelling most often start to get better 2 to 3 days after an injury. Swelling is most often gone in 7 days. Pain may take 2 weeks to go away.